The Sports Medicine Specialists at Towson Sports Medicine have experience treating athletes at all levels of participation. Towson Sports Medicine has had a special relationship with Baltimore County Public Schools and area private schools for more than twenty years. We have Certified Athletic Trainers at several area high schools on a daily basis to provide athletic training services for all athletes. Additionally, Towson Orthopaedic Associates physicians serve as Team Physician for our partner schools. Click for additional information about our High School Team Physicians. FC Baltimore: FC Baltimore is a member of the NPSL. FC Baltimore is made up of Division I-III athletes from around the country. Towson Sports Medicine athletic trainers provide services to the club and Dr. Sarah Hobart will serve as Team Physician. US Soccer: Dr. Sarah Hobart serves on the medical staff for US Soccer. Amgen Tour of California: Dr. Sarah Hobart serves on the medical staff for the one week road race through California. Aloha Tournaments: Towson Sports Medicine is the sports medicine provider for all Baltimore based Aloha Tournaments events. 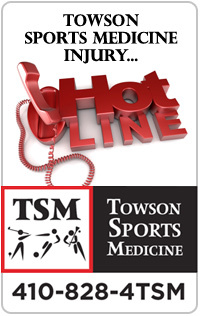 Inside Lacrosse: Towson Sports Medicine is the sports medicine provider for all Baltimore based Inside Lacrosse events. Inside Lacrosse holds national recruiting/showcase events as well as committed academies in the Baltimore area.